Pyramiding involves adding to profitable positions to take advantage of an instrument that is performing well. It allows for large profits to be made as the position grows. Pyramiding is not "averaging down" it is "averaging up" adding to a position to take full advantage of high-performing assets and thus maximizing returns. Pyramiding works because a trader will only ever add to positions that are turning a profit and showing signals of continued strength. These signals could be continued as the stock breaks to new highs, or the price fails to retreat to previous lows. Basically, we are taking advantage of trends by adding to our position size with each wave of that trend. Pyramiding is also beneficial in that risk (in terms of maximum loss) does not have to increase by adding to a profitable existing position. Original and previous additions will all show profit before a new addition is made, which means that any potential losses on newer positions are offset by earlier entries. 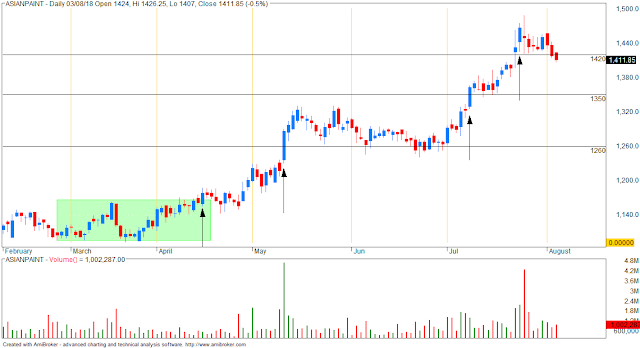 You get a buy signal in ASIANPAINT on 16-APR at 1180 with SL 60 points. For simplicity, we will consider a buy only if stock moves 60 points above our last purchase price i.e. 1180. This means the next buy should be considered only if stock closes above 1180+60=1240. This happened on 11-MAY at 1286 (say 1290). Our next buy should be considered only if stock closes above 1290+60=1350. This happened on 9-JUL at 1363 (say 1365). 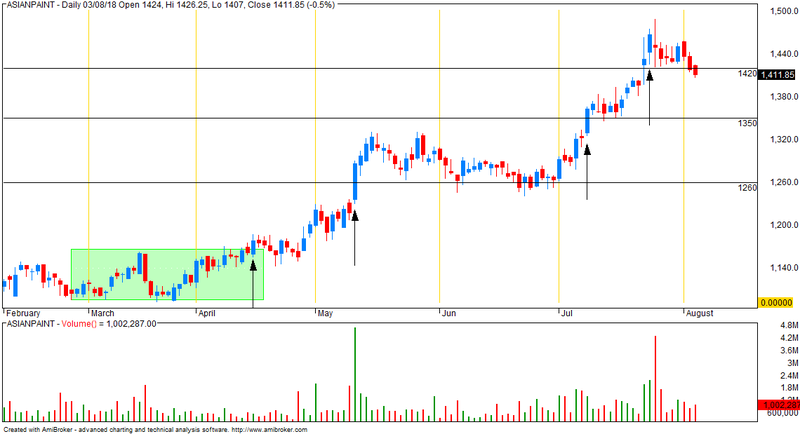 Our next buy should be considered only if stock closes above 1365+60=1425. This happened on 3-AUG at 1412. I have not discussed trailing stoploss here to keep things simple. Ideally you should recalculate SL at every new buy and then using this new SL, calculate the new "buy above" level. When the last trade gets stoplossed, you should exit all positions. In effect, stoploss hit will be funded by the second last open position. Side note: This is a rough draft... hope to improve on this.